‘I remember, I remember…’ A very frequent lament we hear from our clients is that they never asked their older relatives what they do remember, or the unique story of their lives. Everyone has a story to tell, but many such stories go untold; and even with today’s enhanced means of discovering information, many of them never will be. However, simply asking a relative to write down their memories is sometimes asking too much. Those of us lucky enough to have a Family Bible in which were recorded events in the family history know how precious the smallest fragments of information can be. 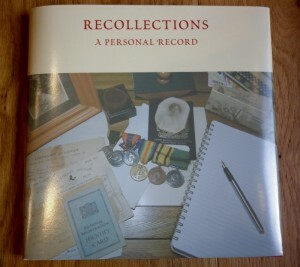 With this in mind, we have designed a new book, which after much deliberation we have entitled Recollections: A Personal Record, as a means of gently teasing out unique family memories and recording them in an enjoyable and satisfying way. Although aimed at those who have long lives to share, Recollections can be used by anyone who wishes to make a record of their own life. The book, which is hardbound and designed to be easy to handle (22 x 22 cm) and to write in, contains 46 pages – many of them illustrated – with prompts for memories and information. It includes two blank family trees, one for ‘Father’s Family History’ and one for ‘Mother’s. 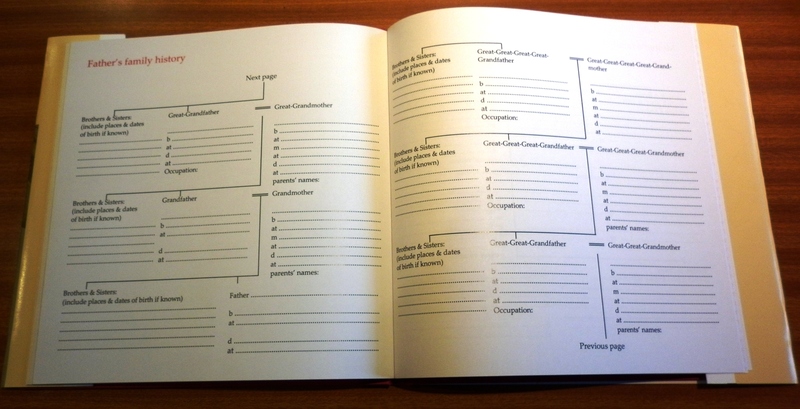 On the other pages the prompts range from the obvious questions about family names, dates and places, to ‘Historical Facts in my lifetime’ (with suggestions), to less matter-of-fact subjects such as ‘Significant Places’, ‘Work Stories’ and a phrase borrowed from seventeenth century inventories: ‘Things Lost and Forgotten’. There are spaces to paste in photographs, if wished, and a final page asks ‘How would you like to be remembered’? The book can be ordered from our website for £20 in the UK including postage and packing; for overseas orders please email us for a price.